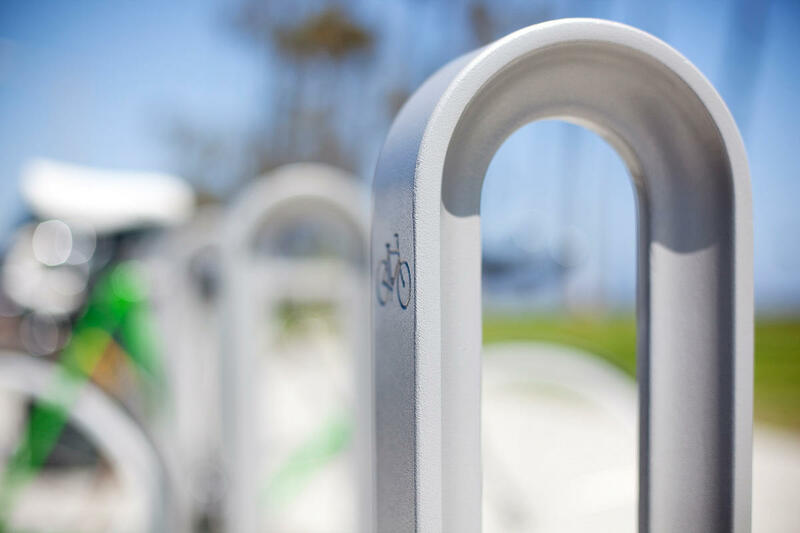 BikeCommuters.com > Articles > Bike Rack Faves – LOCKitUP! Not the greatest picture, trust me I know but I was in a hurry that day. The rack is shaped like a row of bikes leaning on each others handlebars, with the wheels providing amble space to loop a cable or u-lock. The yellow pannier is on my ride at the time. The book shop even provides air for their two wheeled clientele! @JohnnyK: I hate the wavy rack! Who invented that thing!? These are the bullet points on the final article I link to on how builders and designers should choose a bike rack: * Don’t waste your money. * Do not buy products which hold (pinch) wheels. * Be aware of capacity claims and avoid racks which are misused. * Buy products which permit the bike frame and wheel(s) to be locked. 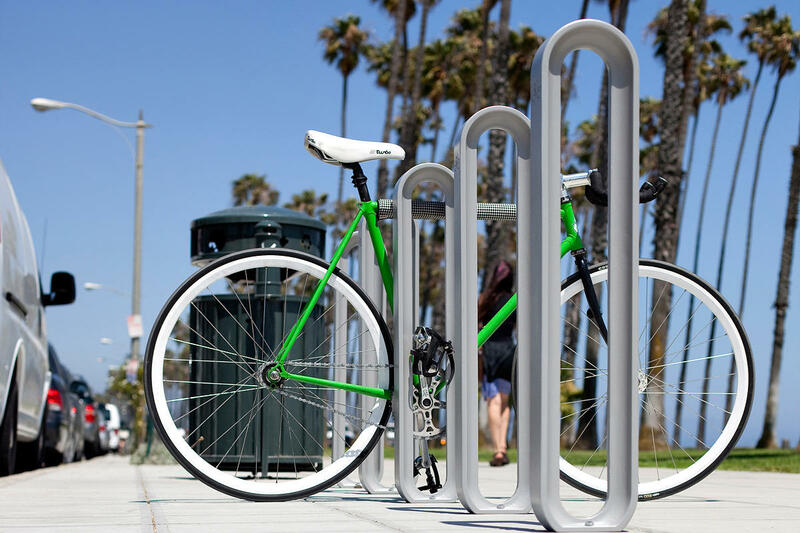 * Locate racks where the cyclists will go – not where you might like them to go. * Avoid racks that have a low profile or could cause a hazard to pedestrians. * Buy only quality products. What I don’t understand is why the fancy corrals don’t have rain shelters—it does that quite a bit in Portland, if you haven’t heard. Everything about the topmost photo in the article is awesome. This is the usual lockup one finds in downtown Tampa. There are some inverted Us, wheelbenders and “art racks” scattered around, but the city went out of their way to istall these weirdos in front of a lot of buildings in the CBD. I never understood exactly how one was supposed to lock their bike up to this…as you can see, the upper “cradles” are padded with vinyl. I just used these racks as if they were a vertical pole. And I hear ya Champs on the covered racks! Here the sun and rain damage can be enough to make you drag the bike inside and stash it in the office until your bosses get mad. Different story in Portland… covered racks get best usage! Great article Mir I Am. We are going to try to get bicycle parking mandated here on Maui this coming year. It’s not enough for just the State facilities to add bicycle parking, it should be ALL facilities. We’ll be using the guidelines in the APBP Bicycle Parkign Manual as the basis for this new ordinance. Your pic of the filled Waikiki bike rack looks them same as Front St in Lahaina on a good night. Too many bikes tangled together, not enough spaces. As a full-time bike commuter, I think they’re a little more functional (in terms of providing frame support, and in terms of accommodating more frame geometries and bikes with lots of accessories) than the Forms+Surfaces option. @Erik Mar – thanks for the tip! Nice Rack! I like that it is embedded in the pad with kwikcrete instead of surface mounted with bolts. I have never used the Forms+Surfaces one before either, just the Dero hoop racks. I’ll keep this one in my back pocket for the next project! @Erik — I want to hear more about the public libraries you designed (I am a librarian by day, celebrity bike-blogger by night).